Totally made up (of currently existing and in development components). Peninsula class gunboat is a joint project of Scandinavian countries: Norway, Sweden, Finland, and ROK. The ship is a trimaran with some stealth features, made mostly of carbon fiber. The main distinguishing feature of the vessel is the fact, that she can be quickly disassembled into 7 parts (main hull, 2 outriggers, 2 connectors, 1 sensor mast and bofors Mk4 turret assembly) and transported by 2 trucks (and at least 1 crane is also required for assemble/disassemble procedure). It also can be trucked in single piece (if road is wide enough and outrigger fuel tanks are empty). The main purpose of this vessel is shore bombardment and artillery support. It was designed to sail in Norwegian fjords, Finnish lakes and in open ocean around the Korean peninsula, it is also designed to be quickly disassembled and transported by land from one side of a peninsula to another (be it Korean or Scandinavian peninsula). For passing extremely shallow waters, special balloons under main hull-outriggers connectors can be inflated to increase her displacement, and for blue water sailing, two 3meter long stabilizer fins can be lowered from her outriggers (one from each). High speed and state of the art gun stabilizer changed the “shoot and scoot” paradigm to “scoot and shoot”. The Peninsula gunboat is capable of shelling enemy with great precision, from a significant range, while maintaining high speed and low visibility. This vessel can be used as much more capable substitute for self-propelled howitzers in lake and river rich regions like Finland as well as carrying out rapid strikes at costal targets and to support amphibious assaults. Outriggers allow coping with recoil of the main gun without overturning and at the same time do not significantly hinder road transportability, they also allow the vessel to operate at high seas. •	Turret hull is made of carbon fiber instead of steel, ballistic protection is provided by Kevlar and ballistic ceramics. •	Turret is fully automated. •	Turret is stabilized in two axes. •	The recoil mechanism is redesigned to push barrel forward before shot to mitigate recoil (similar to XM204). •	Ability to use new Norwegian Kongsberg ramjet 155 shells with maximum range of 100+km. •	Ability to use anti-ship homing shells (possibly even anti-air), similar to 127mm volcano. •	Cannon received active water cooling. •	Radio absorbent and IR concealing materials were used to cover the turret and cannon shroud. 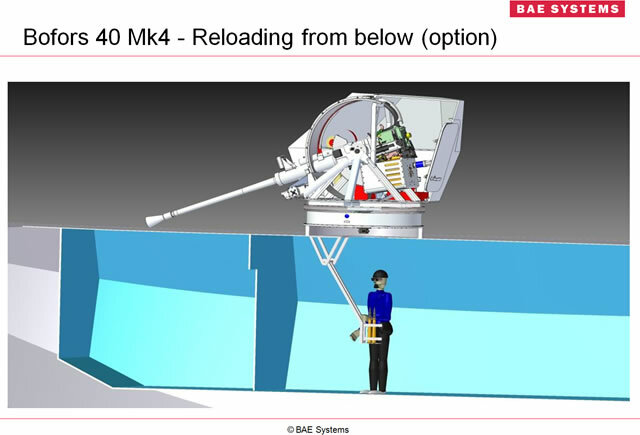 Secondary weapon: 40mm BAE Bofors Mk4 cannon, 8 ESSM or Umkhonto-IR SAMs for anti-air/anti-missile defense. Gun boat is also equipped with smoke dischargers and IR decoys. Vessel is almost invisible for other ships, and is incredibly hard to hit with ASMs, due to its small size, high speed and low observability features, so her true enemy is aviation. Armor: the entire vessel is made of Kevlar reinforced carbon fiber, that allows shrapnel protection. Critical parts of the boat (main turret, bridge, part of crew compartment, engines and ammunition magazines) are also protected with MEXAS composite armor that provides protection against 14.5 mm HMG rounds. Radio operator and gunner are sitting behind and slightly below the bridge and operate foldable terminal stations. Two more sailors work under the main deck, their responsibilities are to move shells to the mechanized part of main gun magazine from unmechanized as well as to replenish supply line of Bofors Mk4 intermediate magazine and to provide general maintenance of the boat. Officers living quarters with three foldable banks are located behind the bridge. Enlisted quarters are located in the nose, forward to the main turret ring (in order to get to the superstructure from there, the main gun and its autoloader must be disabled, as their operation would block the main passage way) with top hatches for emergency escape. Engines and water jets are located under the deck of the rear part of the superstructure. With diesel engine powering central low - medium power water jet, and gas turbine- two high power water jets. Ammunition magazines begin in front of the engines and end at the sides of the turret ring. This arrangement allows outriggers to protect engines and ammunition. Each outrigger contains two nitrogen pressurized segmented fuel tanks, foldable stabilizer fin with actuator, erectable SAM missile launcher with 4 missiles, smoke grenade launchers, as well as IR and inflatable radar dischargers. Radar decoys are much smaller analogs of IDS300 inflatable decoy, designed to be launched from 60mm single shot grenade launchers. For the last line of defense against ATGMs boat can be equipped with APS systems, similar to those, that are used on K2 MBTs. Last edited by SOLariss on March 2nd, 2019, 9:47 pm, edited 2 times in total. Interesting concept but my concern is with fitting all these systems and weights with a hull that displaces 50t at most, that 155mm gun takes up both a substantial amount of weight and will strain the hull/deck around the mounting. Instead a 57mm single bofors mounted in the same place would eliminate the need for both guns whilst offering a lightweight alternative that shouldn't strain a composite hull. Just my two cents though, again welcome aboard! As for the cannon, the idea of this thing is shore bombardment fast moving artillery piece, so it's kind'a essential for the design, don't know how 57mm would help in this case. 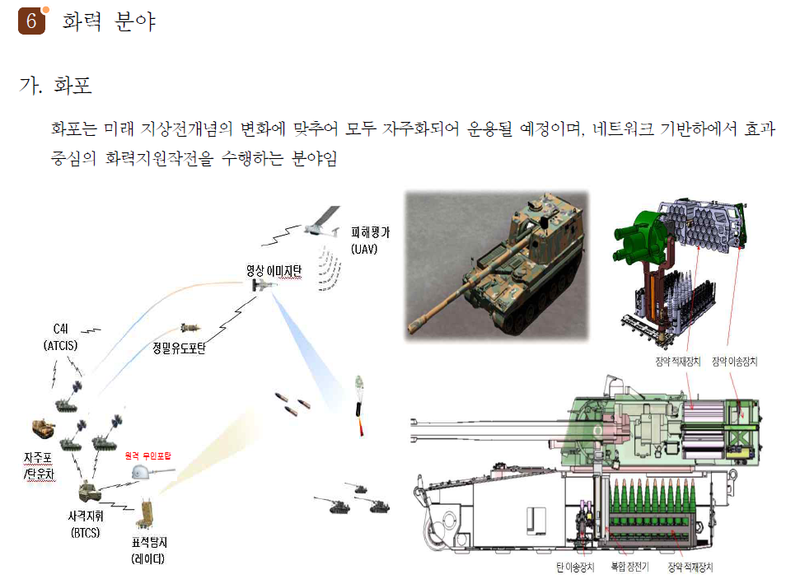 As for mass and displacement, the donor of the turret K9 has mass of 47 tonnes, and it's with steel armor, I believe composite hull would weight much less, however there is more ammunition inside. To tell the truth, I don't know how to calculate displacement of the boat (unless it is a brick), but I understand that it would be marginally enough for all this stuff (if enough at all), hence the trimaran construction (as road transportability is another "requirement"). As for the missiles, 8 ESSM would have weight of 1120kg combined (Umkhonto-1040kg) the problem is the launcher (that does not exist), I envision something similar to one cell erectable VLS (distantly similar to Sylver A-43) with side exhaust port (thus no special fire trench), it shouldn't weight that much. Especially considering usage of composite materials. However I agree that it might be too much, especially given that guided and homing artillery shells (similar to 127mm (in 155mm sabot) Volcano) might be enough to provide some air defense. Also this boats are intended to operate in "packs" that might include other dedicated AA boats. And now for the engine, the 6000hp Rolls-Royce MT7 has such characteristics: lenght 1500mm, height 877mm, width 735mm and weights only 441kg. In fact it is smaller and much lighter than Scania DI13 077M. 551 kW diesel and the real issue IMHO would be the fact that, this turbine must cost a fortune (after all it's V-22 osprey engine). Also, regarding even smaller turbines, generally, the smaller it is-the less efficient it is. My design is basically M18, but slightly elongated and with pontoons for additional stability and buoyancy. Take into consideration that the main turret is from self-propelled howitzer and does not have nearly as much deck penetration as comparable naval guns (with some tradeoff in rate of fire). The entire height of K9 Thunder (the donor of the main turret) is 2.73m (that’s including suspension). Basically, volumetric vise K9 can easily fit on the deck of the similarly sized landing craft (it’s twice as short and slightly narrower that the main hull). 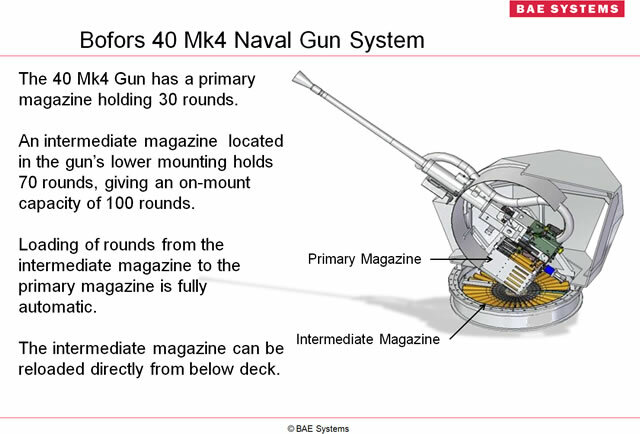 As for the 40mm BAE Bofors Mk4 turret, it also has quite shallow deck penetration (originally I envisioned to use Rheinmetall Oerlikon Millennium Gun, but none of the countries that might benefit of such boat use it). This weapon system was envisioned to be used by small vessels from the beginning. It is also able to be reloaded from underneath (from deckhouse in this case). So volumetrically, all those weapon system won’t have many problems to fit in, however, I’m not sure about mass and displacement though, even with carbon fiber hull it might be too much indeed. As for navies, this are countries that have both resources to design and build such boat as well as possible need of a vessel that can be quickly transported by road from one shore to another, and fight in narrow fjords, lakes and rivers.